Second to only Seoul in the urban scene of South Korea, the wonderful port city of Busan charms visitors in the most peculiar way. Busan itself, while buzzing with excitement, isn’t exactly the main draw for most. It’s the fringes of the city—from white-sand beaches and forested mountains to hot springs and remote temples—that truly paint Busan in its best light, and keep travellers sticking around. Now, this, my friends, is going to be hard. 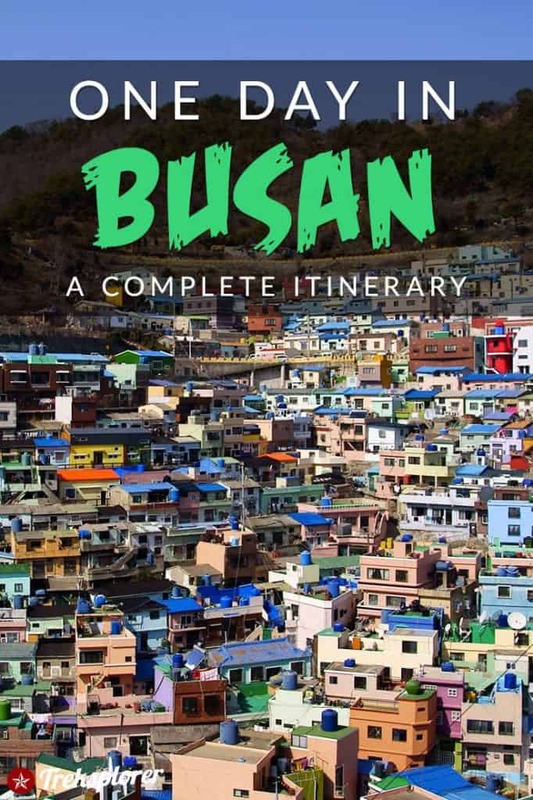 Unlike most of the one-day itineraries I’ve drawn out here, Busan truly presents a challenge. There are a ton of awesome things to do in Busan, but it just so happens that they’re not so conveniently placed for travellers to devour quickly. With only one day in Busan—and I can’t emphasize this enough—you’re going to be in serious overdrive if you try to hit all the top sites. I’ve arranged this 1-day Busan itinerary to minimize travel between attractions, but it, inevitably, leaves out a ton. And although you’ll sometimes see Busan listed as one of the best Seoul day trips, that really pushes the envelope—even with the quick KTX train connections! If you’re feeling a little rushed here, might I suggest instead two days in Busan—or, better yet, three days in Busan—to get to know this city at a more languid pace. Preparing for your Busan itinerary? Don’t forget to protect yourself with travel insurance! 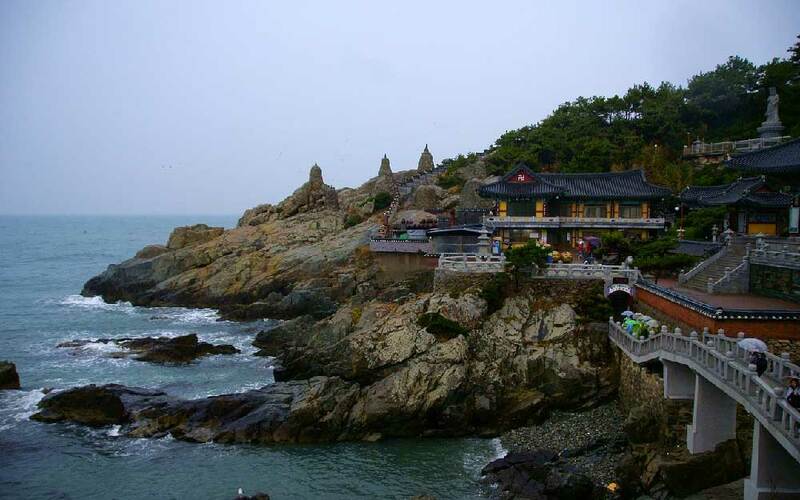 Grab a morning coffee and a quick breakfast snack around your hotel and beeline over to Haedong Yonggungsa Temple in the rugged northeast corner of Busan. Haedong Yonggungsa Temple opens at 5am, just in time for early-risers to catch one of the most iconic sunrises in Korea. Even if you hate waking up in the wee hours of the morning, the tremendous view of the soft glow reflecting off the stone pagodas, stupas, and statues will be well worth your while. Exploring this large temple complex is best done at a relaxed pace. Keep on the lookout for the three-story pagoda adorned with four lions—representing joy, anger, sadness, and happiness—and the cave to the right of the temple that features the Gulbeop Buddhist Sanctum. Getting to Haedong Yonggungsa Temple: Take Busan Subway Line 2 to Haeundae Station. Use Exit 7 and transfer to Bus 181. Get off at Yonggungsa Temple Bus Stop, about 12 minutes away. From the bus stop, it’s about a 15-minute walk to the temple itself. Busan Full-Day City Tour: Explore some of Busan’s most magnificent natural scenery including stops at Taejongdae, Songdo Skywalk, Gamcheon Culture Village and Haedong Yonggungsa Temple. Includes transportation & entrance fees. Full-Day Busan Sightseeing Tour: An 8-hour small-group tour that begins with a visit to the mystical Haedong Yonggungsa Temple, continuing to a number of other sites including Dongbaek Island, Oryukdo Skywalk, UN Memorial, and Centum City. Hotel pick-up/drop-off and a Korean BBQ lunch is included. Busan Premium Photography Tour: Shutterbugs will love this photography-focused tour taking in Busan’s most photogenic sites including Haedong Yonggungsa Temple, Dongbaek Island, and Oryukdo Sky Walk. Tour is led by a professional photographer who’ll capture every moment & send them off to you after the day is done. From Haedong Yonggungsa Temple, backtrack with Bus 181 to Haeundae Station and walk about 500 metres south from Exit 5 (about 8-10 minutes) along Gunam-ro to Haeundae Beach. This fantastic white-sand beach, stretching about 1.5 kilometres, is one of the most famous recreation spots in the city—even, as some might ponder, one of the best beaches in Korea! Whether you’re planning to take a dip in the ocean or not, walking along Haeundae Beach is a worthwhile stop on your Busan itinerary. The coastline and skyline views from here are incredible, all the better if swimming in the ocean is on your agenda. 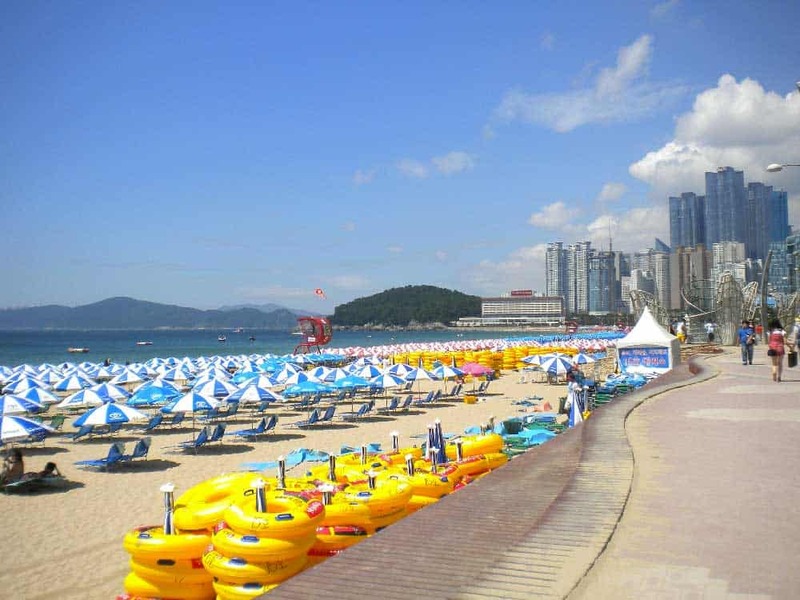 Above all, Haeundae Beach is a great place to put your finger on the pulse of Busan. Day and night, the beach is chock-loaded with locals looking to put their feet up and relax. In the warmer weather, Haeundae Beach also teems with energy, sprouting up street performers like musicians and magicians who entertain passerbys with their artistry. Built up an appetite? There’s a whole slew of restaurants, cafés, and pubs (it’s 5 o’clock somewhere!) line the Haeundae Beach promenade serving a wide variety of Korean and international goodies. Busan Premium Photography Tour: A full-day tour with a professional photographer who’ll whisk you away to Busan’s most beautiful locations including Haeundae Beach and Haedong Yonggungsa Temple for some unforgettable photo ops. Tour includes a yummy traditional local lunch. Full-Day Busan Tour: Start your day off with a walk along Haeundae Beach towards Haedong Yonggungsa on this unforgettable full-day small group tour. Other stops include Dongbaek Island, Nurimaru APEC House, and the Oryukdo Skywalk. Via subway, zip over to Toseong Station (Line 1) where it’s a 20-minute walk to one of the Busan’s most compelling corners, Gamcheon Culture Village. 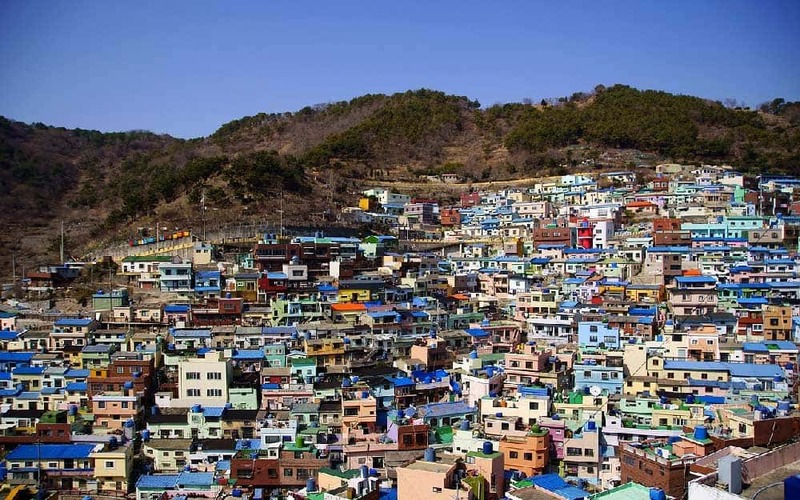 Sure, nicknames like “Machu Picchu of Busan” or “Santorini of Korea” are a bit of a stretch, but this colourful mountain-side neighbourhood is undoubtedly one of the city’s coolest sites to visit—even if you’ve only got 24 hours in Busan. Walking into the “village,” you’re immediately arrested by the colourful houses clinging to the hillside. This area, once a Busan slum, is now an artistic enclave in an otherwise (usually) sober city. The narrow climbing streets of Gamcheon Culture Village feature vivid artwork from murals to sculptures and hide craft shops, art galleries, and teahouses. Above all, Gamcheon Culture Village is one of the best places in Busan to wander about. The views throughout are simply arresting, feeling, at times, a little more like Mediterranean Europe or Central America than East Asia. Spend some time here, soaking up the atmosphere and engaging with the shopkeepers to get a sense of Busan’s more artistic side. Busan Full-Day Tour: A value-laden full-day tour visiting some of Busan’s most compelling attractions including Gamcheon Culture Village, Haedong Yonggungsa Temple, and the Songdo Skywalk. All transportation and entrance fees are included. Busan Tour with Gamcheon Culture Village: An action-packed 8-hour featuring central Busan’s top sites including Gamcheon Culture Village, Gukje Market, and Jagalchi Fish Market. Entrance fees, transportation & a Korean BBQ lunch are included. Private Busan City Tour: A private tour of Busan offering superb value. Takes in some of the city’s top tourist sites including Gamcheon Culture Village, Beomeosa Temple, and Jagalchi Market. Once you’ve had your fill of Gamcheon Culture Village, descend (or take a local bus) back to Toesong Station in the city centre. From here, it’s a quick jump on the subway to Jagalchi Station where one of Busan’s most important cultural attractions, Jagalchi Market, awaits just 5 minutes away by foot. To be sure, this isn’t your ordinary collection of Korean street vendors. Jagalchi Market is one of the most famous markets in Korea, selling a mind-boggling variety of the freshest live & dried seafood you’ll ever see. Everything from squid and octopus to mackerel and eel lines the stalls here, accented by the hollers of the ajumma beckoning for your business. 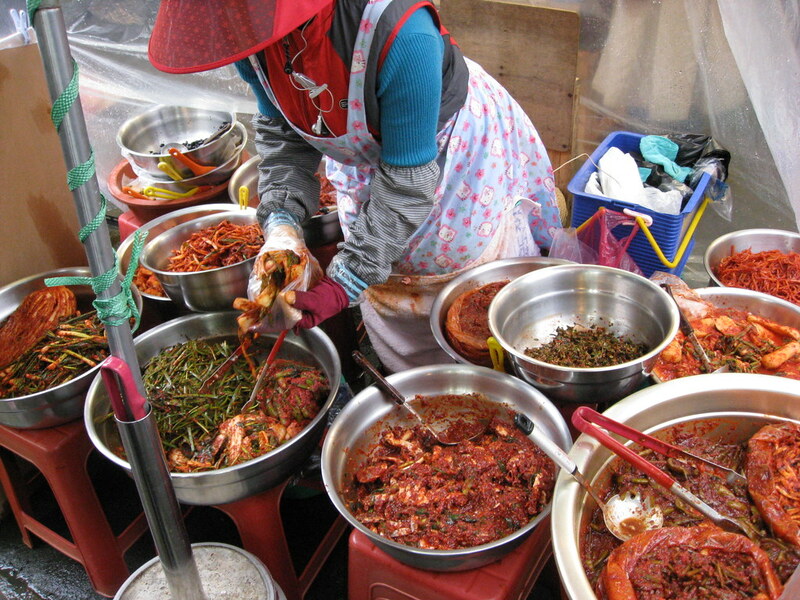 For the cultural experience alone, a walk through Jagalchi Market is an absolute must-do while in Busan. If you’re a fan of seafood, don’t miss an opportunity to visit the second-floor hoe (raw fish) restaurants for a taste of the freshest catches you’ll find anywhere. Premium Busan Photography Tour: A full-day tour led by a professional photographer that absorbs some of central Busan’s most exciting photo spots including Jagalchi Fish Market, Gamcheon Culture Village, Yongdusan Park, and Samwang Temple. All entrance tickets, transportation, and professional photos to remember your trip are included. Private Busan City Tour: Join in on this 8.5-hour private tour to catch all of Busan’s top attractions in action including Jagalchi Fish Market, Gukje Market, Gamcheon Culture Village, and Busan Tower. Hotel pick-up/drop-off is included. If the sight of weird sea creatures of Jagalchi Market got you a little spooked, bolt north along Junggu-ro to the less “fishy” stalls of Gukje Market. 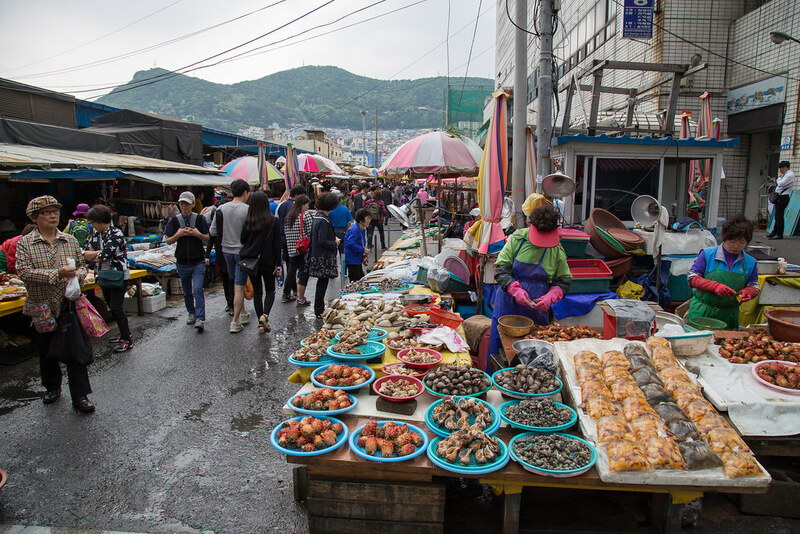 This market, one of the biggest in Korea, has had a long history of wheelin’ and dealin’ all the goodies that pop off the ships at Busan Port dating back to the Korean War. Inside Gukje Market, prepare to find just about everything you’ll ever need whether its electronics, clothing, souvenirs, household goods or—like any good Korean market—food. Indeed, along with other interconnected markets like Bupyeong (Kkangtong) Market, Gukje Market is one of the best places in Busan to eat Korean street food. Keep your tastebuds on alert for specialties like bibim dangmyeon (spicy glass noodles topped with fish cakes) and ssiat hotteok (sweet Korean pancakes filled with seeds and dark sugar) among usual favourites like kimchi and tteokbokki. Private Busan City Tour: An excellent value full-day tour scooting around to central Busan’s most compelling sites including Gukje Market, Gamcheon Culture Village, and the stunning Beomeosa Temple. All transportation and entrance fees are included. Busan Tour with Gamcheon Culture Village: See the best of Busan on this comprehensive full-day tour including stops at Gukje Market, Gamcheon Culture Village, Samgwang Temple, and the Mount Hwangnyeongsan Observatory. Busan Night Yacht & Night Market Tour: A unique and value-laden tour combining a relaxing yacht ride in the harbour with a visit to the Nampo-dong area including Gukje Market and BIFF Square. At just 49 metres, Yongdusan (Dragon Mountain) may seem like a slightly overconfident name. But that shouldn’t stop you from sticking Yongdusan Park into your 1-day Busan itinerary. Even with the smaller stature of its “mountain,” this downtown park features surprisingly good views of Busan while walking among its beautiful vegetation, pagodas, and statues. To add a little extra oomph to the vista, scale up Busan Tower (W8,000), for a height that’s over two times higher than the “mountain” itself. Getting to Yongdusan Park is half the fun. From Gukje Market, head back down to Gwangbok-ro, turning left to walk east. This street of Gwangbok-ro is Busan’s high fashion street (like Myeongdong in Seoul) where all the latest brands compete for your eyeballs and your won. As you near Nampo Station on Gwangbok-ro, about three blocks after Gwangbokjungang-ro merges with it, you’ll see a set of escalators to your left (between K-Swiss and Gong Cha) that will take you up to the park Hong Kong Mid-Levels style. Busan Tour with Gamcheon Culture Village: One of the most comprehensive Busan tours with stops at Yongdusan Park, Gamcheon Culture Village, Gukje Market, Jagalchi Fish Market, and the Mount Hwangnyeongsan Observatory. Free hotel pick-up/drop-off is included. Private Busan City Tour: An incredible value full-day tour focusing on the sights of central Busan including stops at Yongdusan Park, Busan Tower, Gukje Market, Gamcheon Culture Village, and even Beomeosa Temple. Private transportation included. Premium Busan Photography Tour: A cool photo tour sweeping through some of the most picturesque locations in central Busan including Yongdusan Park, Songdo Sky Walk, and Gamcheon Culture Village. Tour price includes transportation, entrance tickets, and professional photos to take as souvenirs. Whew! I’d have to say that was quite day. By now, I certainly wouldn’t blame you if you’re tired out and are looking for nothing more but a quiet evening close to your hotel to unwind. But… if you’ve got a little more gas in the tank, an evening view of Gwangandaegyo Bridge is something that you just shouldn’t miss in Busan. Bridging the 7.4 kilometres gap between Namcheon-dong and Centum City, Gwangandaegyo Bridge is the longest of its kind in Korea and a feat of modern engineering. At night, the bridge lights up, blending with the soft evening glow of the cityscape, for a scene that’s like none other in Busan. To dabble in the best views of Gwangandaegyo Bridge, scoot over to Gwangalli Beach, just a 10-minute walk from Exit 3 & 5 of Gwangan Station (Line 2). Besides its fine white sand and Gwangandaegyo Bridge “viewing parties,” the Gwangalli area is loaded with restaurants, cafés, and fashion boutiques to fritter away the perfect night in Busan. Busan Night Tour Including Cruise: Watch the city’s most magical moments unfold on this comprehensive evening tour. Highlights include a sightseeing cruise past top sights like Gwangandaegyo Bridge, Taejongdae, and Dongbaek Island as well as a visit to the Mount Hwangnyeongsan Observatory. All entrance fees and hotel pick-up/drop-off is included. 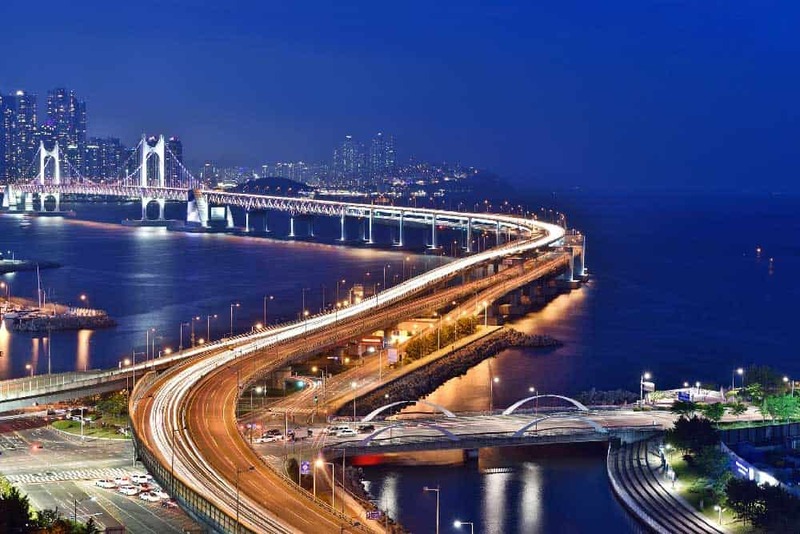 Busan by Night: A 3-hour coach tour where you’ll enjoy unforgettable evening views of Gwangan Bridge and the Gwangalli Beach area. Busan Marine City Night Tour: Absorb the city’s night vibes on this 3-hour tour including a yacht ride past Gwangandaegyo Bridge, Marine City, and Nurimaru APEC House. Also includes a visit to the Mount Hwangnyeongsan Observatory. Much like Seoul, choosing where to stay in Busan isn’t always easy. The city is spread far and wide, so much of the accommodations inventory isn’t necessarily perfect for travellers. Among the best areas to stay when you only have one day in Busan are Nampo-dong, Jung-gu and Dong-gu. All of these neighbourhoods are well-connected to the rest of the city and offer quick access to many of the attractions we’ve listed here. 24 Guesthouse Nampo Station: A great budget guesthouse featuring both shared accommodations and private rooms with private bathrooms. The prime location beside Nampo Station puts much of this Busan itinerary at your fingertips. Stanford Inn Busan: A superb central hotel that’s minutes from Jagalchi Market. The stunning city and sea views from the rooms are far more luxurious than its 3-star label lets on. GnB Hotel Busan: A top mid-range Busan hotel throwing down some excellent value in an epic location steps away from Gukje Market. The large room windows, even in the economy rooms, show off incredible vistas of Nampo-dong and beyond. Aventree Hotel Busan: An elegant 4-star hotel showcasing impeccable modern style and awesome views over central Busan. The location just outside of Gukje Market is perfect for foodies and shopaholics alike. Full-Day Busan City Tour: A value-laden sightseeing tour taking in some of Busan’s highlights including Taejongdae, Gamcheon Cultural Village, and Haedong Yonggungsa Temple. Includes all transportation and entrance fees. Private Busan City Tour: An 8.5-hour full-day tour that drops into some of the top Busan attractions inside and outside the city centre including Beomeosa Temple, Gamcheon Cultural Village, Jagalchi Fish Market, and Busan Tower at Yongdusan Park. Tour includes a professional English-speaking guide, all transportation, and hotel pick-up/drop-off. Busan By Night Tour: A unique 3-hour evening tour featuring the best of Busan after dark. Trip highlights include a night panorama over Busan from Mt Hwangryeong and the buzzing nightlife of Gwangalli Beach. Hotel pick-up/drop-off is provided. By air: Busan is served by Gimhae International Airport (PUS). All the major Korean airlines fly out of Gimhae Airport including Asiana Airlines, Korean Air, and Jeju Air. Most direct international flights from Busan are to other Asian destinations including Hong Kong, Taipei, Beijing, Manila, and Tokyo. Looking for cheap flights to Busan? I’d recommend searching for flight deals on CheapOair! By train: If you’re already in Korea, the best way of getting to Busan is by train. The high-speed KTX service zooms between Seoul and Busan in just 2.5 hours. This is the perfect route to put your Korail Pass to work. Like Seoul, getting around Busan is a cinch with its comprehensive public transportation system. The easiest way for travellers to scoot around the city is definitely by subway. Metro rides normally cost ₩1,500 each. If you’re planning on taking 4 or more subways—which is likely with this itinerary—I’d recommend getting a 1-day Busan metro pass. The pass costs ₩5,000. You can purchase one at any of the ticket vending machines in Busan’s subway station. In the mood to get a little silly? Pop into the 3D Trick Eye Museum on the way to Gukje Market to throw some fun optical illusions into your travel plans. Won burning a hole in your pocket? Watch it disappear at the glitzy stores of Centum City including Shinsegae Centum City, one of the world’s largest department stores. Want to get flashed with some epic evening vistas? Grab a rooftop dinner at The Bay 101, an oceanside cultural complex that promises incredible nighttime skyline views. Like this article? Share & pin it for later!